Invoicing couldn’t be simpler. Quickly add all relevant timesheet entries and expenses to each invoice, or create a free-form invoice in minutes. 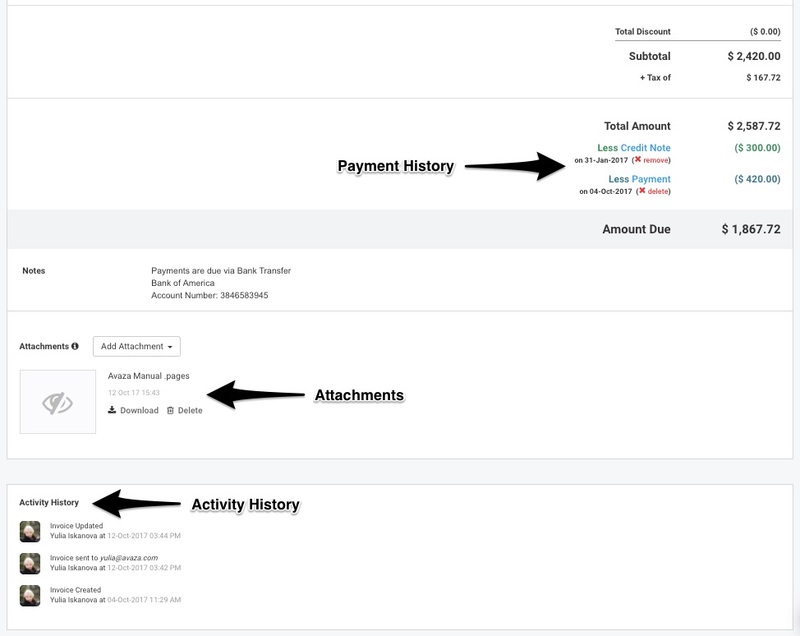 You can also track partial payments and credit notes in Avaza, or add attachments to invoices. Before you get started with creating Invoices you should take a look at your account settings. Navigate to Settings to get started. Most of your General Settings are pre-filled from your sign-up form. Your Company Name is displayed on all Invoices. The default currency you provided while signing is used to default the currency when creating a new customer. Invoices are created using the customer’s currency. You can learn more about multiple currencies in Avaza here. 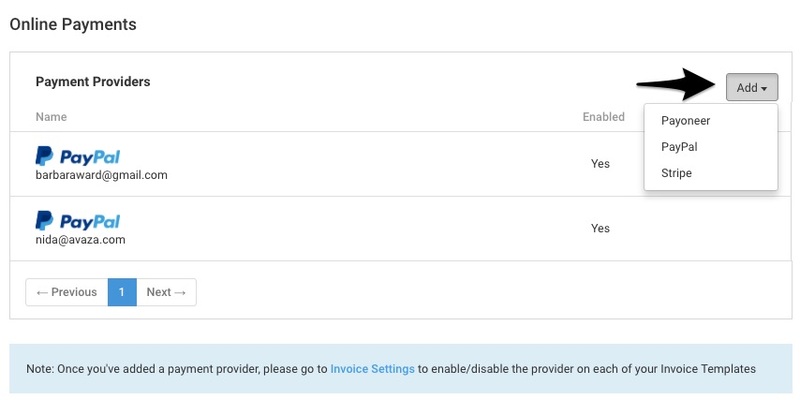 Head over to Invoice Settings and check that it is set up based on your invoicing preferences. Billing Address: This will appear on your invoices. We recommend entering the Tax/Business number in the Display Address field if it is a legal requirement in your country. You can click “override display address” to do this. Default Trading Terms: This field is used to calculate the Invoice due date based on the selected Issue date. You can choose between “Upon receipt” or 7, 15, 30, 45 and 60 days. These Default Trading Terms are added to each External Company in your contacts, but can be changed for each customer if needed. Invoice/Credit Note/Payment & Estimate Prefixes: Used to easily identify different types of transactions. Default Inventory Items for Timesheets and Expenses: This sets the default Inventory Item when adding Timesheets & Expenses to Invoices. Show Amounts as: Choose between Tax Exclusive & Tax Inclusive. This is used to pre-fill the Invoice header but can be changed when you create the Invoice. 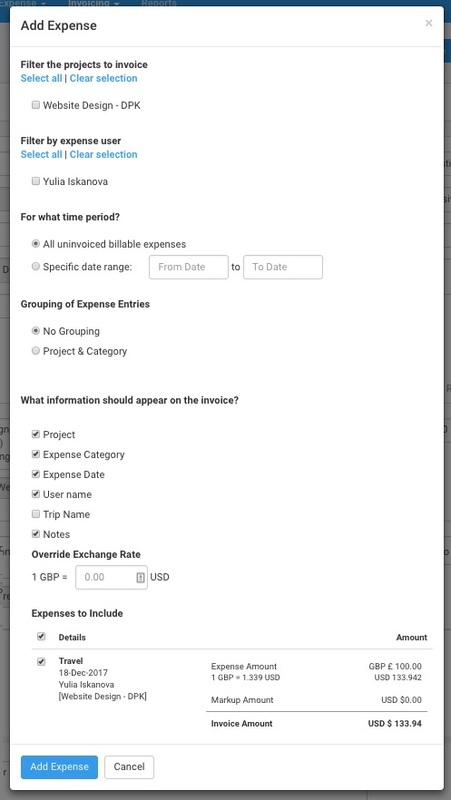 Enable Project Invoice Link: This setting allows you to link individual line items on Invoices and Credit Notes to specific projects for accurate reporting. Recurring Invoice Send Time: If you use Recurring Invoices, you can set the time at which they are sent out. Invoice & Quote/Estimate Templates: The Invoice/Estimate Templates section lets you customize your Invoices. You can create multiple Invoice templates and brand each one differently by uploading your logo. 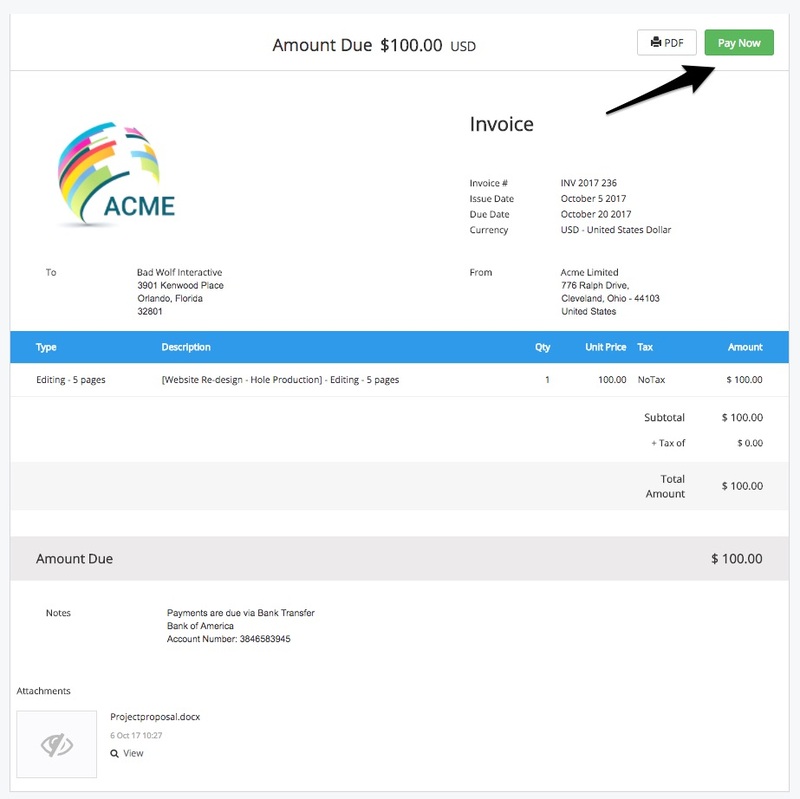 You can also change colors for the table, show/hide columns, enter default Invoice notes, override invoice labels and enable online payment options. Avaza allows you to add different payment gateways to accept payments from your clients. Currently, we support Paypal, Stripe and Payoneer. Navigate to Settings > Online Payments to add and edit online payment methods. 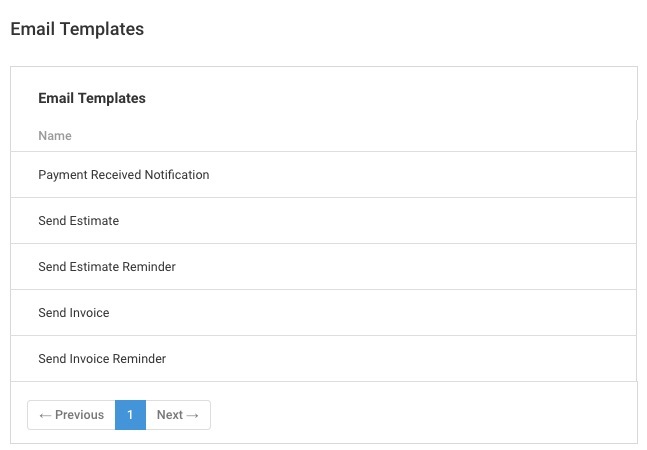 You can enable or disable these for your account, or add them to your Invoice Templates as needed. Read more about adding Online Payment methods here. Will you be charging sales tax? If yes, then you will need to add this to your Tax Settings. Navigate to Settings > Tax Settings and create or edit Taxes as needed. Read more about setting up taxes in Avaza here. Inventory items are things you invoice your customers for. 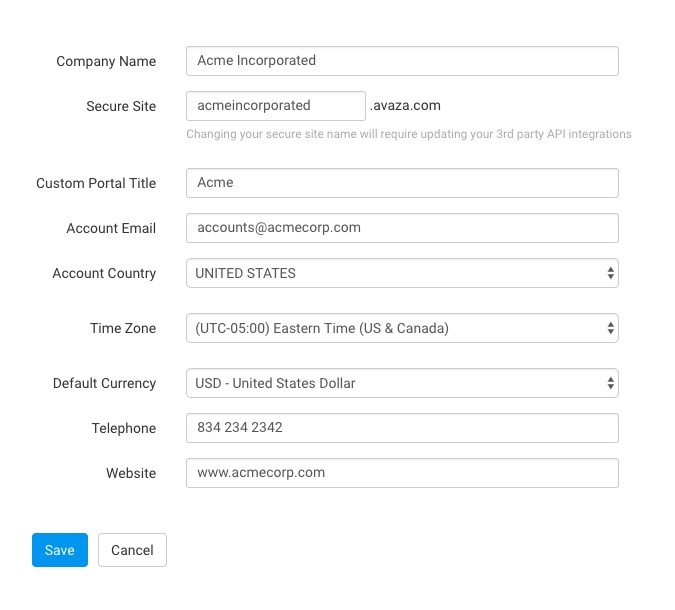 Setting these up initially allows you to save time when creating Invoices. Navigate to Settings > Inventory Items to set these up. By default, a few Inventory Items are already set up in your account. Read more about setting up Inventory Items here. Please note: You cannot delete Inventory Items that are setup to be defaults for Timesheets and Expenses. You can change this by going to Settings > Invoice Settings. Do you want to customize the emails your clients receive when you send them an Invoice or an Invoice Reminder? Navigate to Settings > Email Templates to do this. Read more about Email Templates here. Ready to create your first Invoice? Navigate to Invoicing > Invoices, and click the +Create button. Choose the customer you are creating the Invoice for, or add a new customer. Adding a new customer at this stage automatically adds them to your External Contacts list. You can always edit customer details later. You can also filter the customer drop-down to only those customers that have uninvoiced Timesheets, Expenses and Task Fixed Amounts. With Avaza, you can add free-form line items, or bulk add your uninvoiced timesheets, expenses, and task fixed amounts to an invoice. You can read a field-by-field explanation in our detailed guide here, however, most of the required fields will be pre-populated based on the settings we walked through earlier. 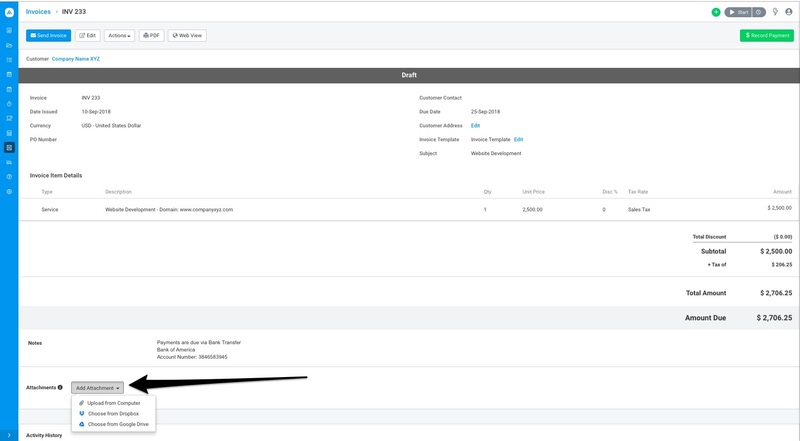 If you are billing your customers based on time, click the Add Time button on the top right to view the Add Time popup. You can also choose what information from the timesheets you wish to add to the line-item description. 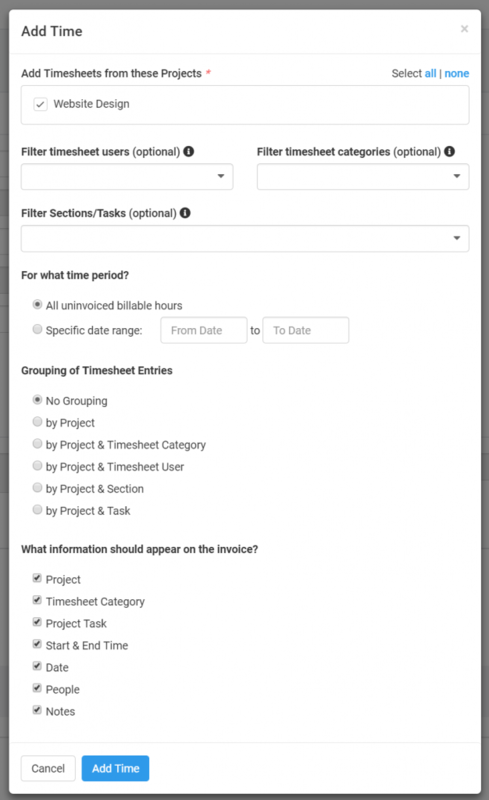 Your options include: project, timesheet category, project task, start & end time, date, people (who logged the timesheet) and notes. 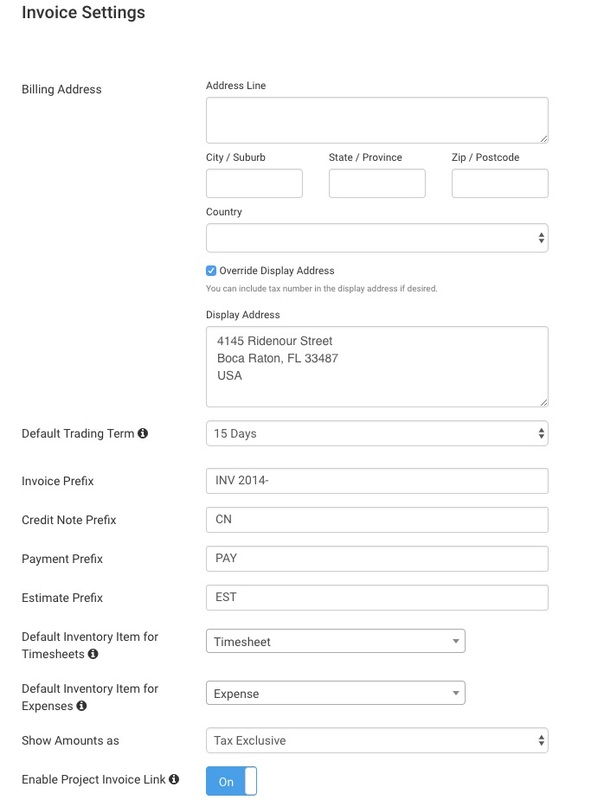 To add billable expenses to an Invoice, click the Add Expense button on the top right. Filter expenses by Project, Expense User and Date Range. You can also group Expenses by Project & Category and choose the information to be displayed on the Invoice line-item description. You will be able to see all billable expenses displayed as a list on the popup and check the ones you wish to include on the Invoice. You can also override the exchange rate set when creating the expense if the expense is in a different currency from the client’s. Do you track Fixed Billable Amounts on Tasks? 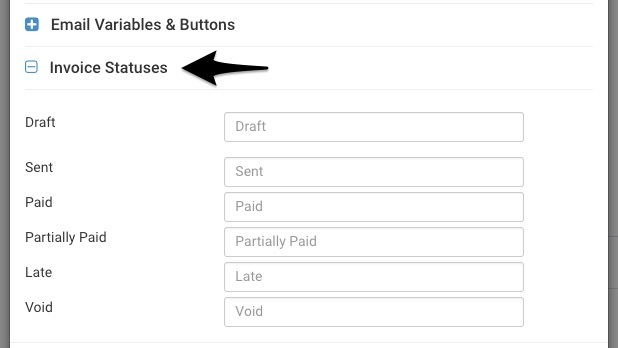 The Add Fixed Amount button lets you add Fixed Billable Amounts to an Invoice in two clicks. 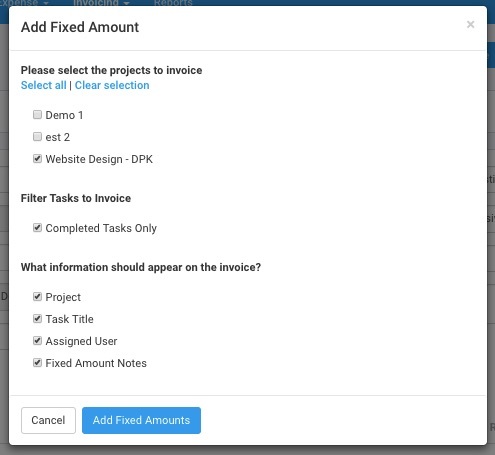 Select the Project you want to invoice, and choose whether you want to include Fixed Amounts on completed tasks only. Choose the information you would like to show on the Invoice line-item description, and click Add Fixed Amounts. When you are done adding timesheets, expenses, fixed amounts or free-form line items, you will see that your Invoice has been populated with all of the relevant information. Once the Invoice has been saved as a Draft, you can add attachments. These can be expense details, timesheet details, documents, or any other files you wish to include that the client may need. You can upload these from your computer, Google Drive or Dropbox. Invoices can either be emailed to clients or downloaded as a PDF. You can also record payments directly. To download an Invoice, click on PDF to copy it to your hard drive. You can view it online, via “Web-View”, which is another way your customers can view invoices you send them. The “Web-View” includes attachments, an option to download it as a PDF, and an option to pay online. Using the Actions drop-down, you can mark as Invoice as Sent, revert it to Draft, apply a Credit Note or Existing Payment or send the customer a reminder email. You can also copy the Invoice, Void it or Delete it. With Avaza, you can also convert Invoices into Projects. 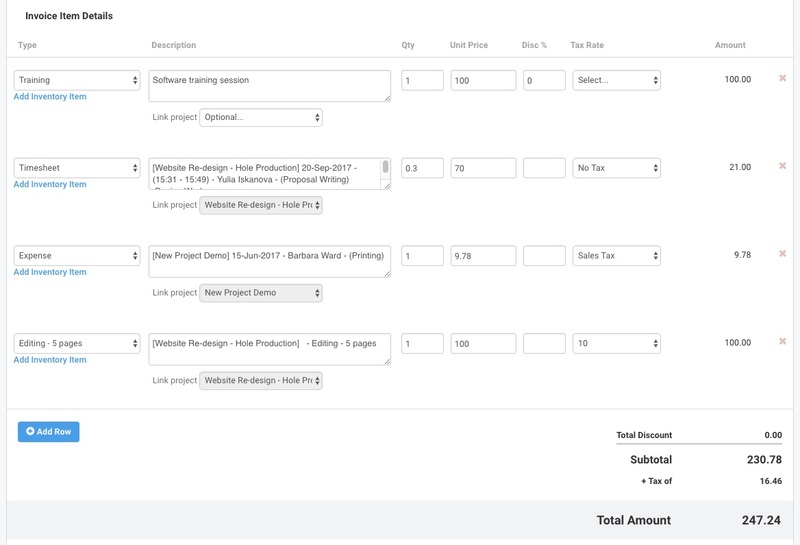 Each line item on the invoice is added as a task into the Project. At the bottom of this screen, you will be able to view the Activity History. This shows you a history of edits, and when the Invoice was sent to the client, along with any reminder emails. You can also see if the client has viewed the invoice email, or web-view. All of your Invoices can be viewed on the Invoice Overview page. Outstanding Invoices can be filtered based on their status (draft, sent, partially paid, late and void) or searched using the search box. You can also search through the Paid invoices using the search box provided. You can also change the invoice status labels by updating the Invoice Template. Simply navigate to Invoice Settings > Invoice & Quote/Estimate Templates > Layout tab > Invoice Statuses. Hope this guide helps you understand how to create and manage invoices in Avaza. If you need further help, feel free to contact our support team via chat or email.